James is available for children's parties, preschool concerts and special events in New York and surrounding areas. 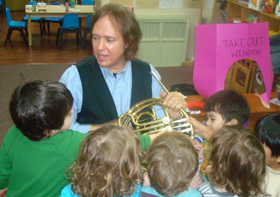 He brings his guitar, harmonicas, parachute and animal puppets, as well as rhythm instruments for the kids to play along. He also brings a special instrument, such as the accordion or trumpet. The children dance, jump, clap and sing along as both children and parents are drawn into an interactive musical experience that is fun and educational. For larger events, James will bring a professional sound system to fill the venue. Booking fee: $200 for a 45-minute set. ©2012 James Humphrey. All Rights Reserved.